Since installing its impressive Allosaurus exhibit more than two years ago, the Creation Museum has been working to have the dinosaur’s skull tested with CT scans and 3D imaging to learn as much as possible about the massive creature’s life and death, especially focusing on the largely intact skull, thought to be the best example of an Allosaurus skull discovered to date. This testing was recently completed at 3D Engineering Solutions, one of the few companies in the world to have the capability of doing such tests, conveniently located near Cincinnati (about 30 miles from the museum). 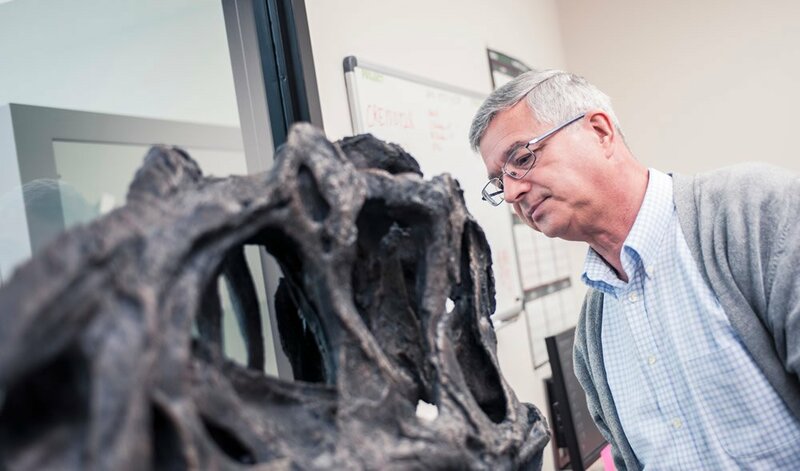 Dr. Andrew Snelling of AiG and the Creation Museum’s world-class dinosaur skull. 3D Engineering Solution’s industrial CT (computer tomography) scanner is one of only 5 or 6 like it in the nation, and is able to penetrate dense objects such as minerals or metals with a high resolution, Answers in Genesis (AiG) president Ken Ham explained in a Facebook live post about the testing. The Allosaurus scans have made it possible to see the details inside the brain cavity, including the size and shape of its brain case and the lines where the bones fused together as the creature grew. As far as AiG can determine, this is the first time that an Allosaurus skull has been scanned, making this cutting-edge research that is being accomplished by creationist scientists. AiG plans to make the scans available for outside researchers to study as well. In addition to the technological research, Dr. Snelling has already started a site study where the skeleton was discovered in Colorado, in collaboration with Dr. John Whitmore, geology professor at Cedarville University, to discover more about the animal’s demise a few thousand years ago. Their research will be published in AiG’s peer-reviewed Answers Research Journal. Allosaurs, sometimes confused with a T. rex, were large theropod dinosaurs. This allosaur, nick-named Ebenezer, is exceptional not only for its almost-complete three-foot-long skull (including 53 teeth) but because its bones, rather than mixed and scattered, were found together (with many in their articulated position). The creature likely weighed 2.3 tons. Over 50 per cent of its bones were recovered and are on display at the Creation Museum in the “Facing the Allosaurus,” exhibit. Valued at $1 million, the Allosaurus was donated to the museum by Michael and Stephen Peroutka of the Elizabeth Streb Peroutka Foundation. The Creation Museum is an outreach of the apologetics organization of Answers in Genesis (AiG), and is home to several impressive dinosaur exhibits. Now in its tenth year of operation, the museum is seeing its best attendance ever. AiG also opened a full-size Noah’s Ark last July on 800 acres in Williamstown, Kentucky (40 miles from the museum), which has drawn about 450,000 visitors in four months. Some exhibits inside the Ark deal with the demise of dinosaurs and its gift store carries books and DVDs produced by Ken Ham and others on the topic of dinosaurs and the Bible.